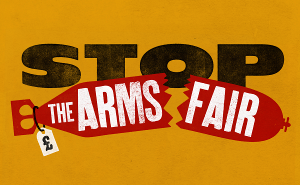 Stop The Arms Fair is a network of groups and individuals who have joined forces to put an end to DSEI and all UK arms fairs. DSEI is one of the world’s biggest arms fairs. For one week every two years, in East London, arms companies display their weapons to buyers from around the world, including countries in conflict, authoritarian regimes and countries with serious human rights problems. The UK government helps to organise this arms fair, invites these military buyers from around the world, and helps arms companies to make deals, at taxpayer expense. This has to stop, and together we can stop it. DSEI is planning to return on 12-15 September 2017 and we are already working to stop it. Take action to challenge the arms fair, its organisers and the exhibitors that make a profit from killing and repression. Check out our events page to see what we’ve got planned in the coming months. Join us on Facebook, follow us on Twitter, spread the word, and join us on the streets as we mobilise to Stop The Arms Fair!